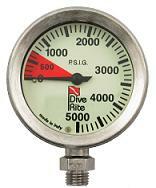 •	Submersible Pressure Gauge (SPG) – measures the diver’s air supply. •	Depth Gauge – measures the diver’s current depth. •	Timing device – measures the diver’s time underwater. •	Compass – tells the diver their direction of travel. •	Thermometer – tells the diver how cold they are. When we dive down the toll road or freeway, we need some basic instruments to give us some basic information. 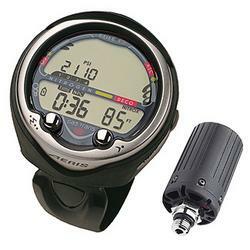 Having scuba diving gauges underwater is no different; we need almost the same basic information. In our car we have the gas gauge; well the submersible pressure gauge is very similar, it will tell us how much air we have. Like all scuba diving gauges, if we don’t read them, they do not fulfill their function very well. Unlike the car’s gas gauge, running out of air can lead to more serious consequences underwater. To read more about Submersible pressure Gauges (SPG), visit our SPG page. Depth Gauges – Depth Gauges are like the trip meter in our car, but are far more important. The purpose of the depth gauge is to tell the diver their maximum depth and current depth. These are important calculations in understanding the Nitrogen Tissue Loading discussed in our dive tables. Remember to use the dive tables effectively; we need to know our maximum depth and dive time. The timing device or watch is a critical component of this system. Because the dive table calculations are a hassle, many divers choose to use a diving computer to handle these calculations. I still recommend a backup depth gauge and watch, just incase the computer has a malfunction. Visit our depth gauge page. Timing device – yes it can measure your time underwater. But, like all gauges, if you do not read it, it will not fulfill its function. We cover dive watches extensively in our dive watch section. Check out our extreme watches that the Navy Seals love to use. Compass – while most internet sources claim that the compass is not vital, jus get lost on one dive and you will understand why we believe the compass is very vital. Diving at night or in low visibility, makes it very difficult to stay orientated underwater. 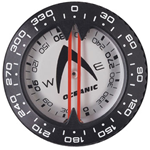 Using a dive compass, will aid you in finding your way back to the boat or shore. Once again the compass works great if you know how to use it. Check out our compass pages here to see some popular ways to setup you compass. Thermometer – while this is not an important scuba diving gauge to use underwater, it is pretty handy to know the temperature of the water before the dive. Most good depth gauges include a thermometer as an added function. Underwater if it starts to feel cold, a diver can adjust their depth to get above the thermocline. Lastly, Scuba computers act as a very important integration of all of these functions. Most instructors use a dive computer to accurately prioritize their gauges and to give them second by second updates. Most dive computers can be divided up between air integrated or non air integrated. If your computer has an integrated air function, your computer can now calculate the diver’s air consumption and make predictions on how long the air supply will last at the current consumption levels. Add some alarms and now you have a secondary warning system. Why secondary? I always trust my brain over the computer’s brain. If you don’t look at it, it might not be working. Not to sound like some buddies mother, but once again most of these scuba diving gauges are passive devices. You must read them or they do not do any good. If you do not know how to use them, ask some one. If you do know how o use them, help some one. When your dive buddy grabs you regulator from you mouth, is not the time to realize they did not know how to use their gauges. Try this, look at your gauges every minute for ten dives. It is always better to have too much information, than to little information. On your eleventh dive, you will notice that you have built some good dive reference habits, because you are consistently looking at your gauges. Check out our scuba diving gauges maintenance page on how to keep your gear in tip top shape or our spare parts list, to handle those dive time malfunctions.